European Bulk Services (EBS) operates a dry bulk terminal for intermediate storage of mineral bulk, agribulk and biomass products. The terminal has a total annual throughput of approx. 8 million tons, and a total land area of 30ha. A transformation of a terminal into an ultra-modern agri bulk hub and woodpellet terminal was needed. European Bulk Services (EBS) operates a dry bulk terminal for intermediate storage of mineral bulk, agribulk and biomass products. The terminal has a total annual throughput of approximately. 8 million tons, and a total land area of 30ha. EBS was seeking to expand their activities on the terminal and acquired 2 million tons additional cargo annually. The existing civil structures suffered from lack of maintenance. 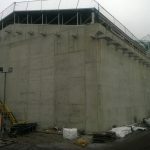 Therefore the structures were assessed, a rehabilitation plan prepared, costs estimated and the risks analyzed. European Bulk Services (EBS) operates a dry bulk terminal for intermediate storage of mineral bulk, agribulk and biomass products. The terminal has a total annual throughput of approximately. 8 million tons, and a total land area of 30ha. Maasvlakte 2 is a 2.9 billion euro expansion in the Port of Rotterdam, resulting in an extra 1000 ha terminal area of 1.000 hectares dedicated to container handling (600 hectares), distribution facilities (200 hectares) and chemical industry (200 hectares). In total a sea defense of 12 km is erected, 250 Mm3 sand is dredged and reclaimed, 10 km of quaywall (to -20 m) is built. This nearshore area is a particularly sensitive natural habitat (both marine and terrestrial life). For this reason design, planning and execution of the works was done with utmost care.